Most of the time I'm a savoury girl through and through - give me sausage rolls and crisps any day - but when Haute Dolci invited me to review their newest dessert restaurant at Cheshire Oaks, I thought it was well worth checking out. So my mum and I put on some pretty dresses and drove down to see what sweetness we could sink our teeth into. 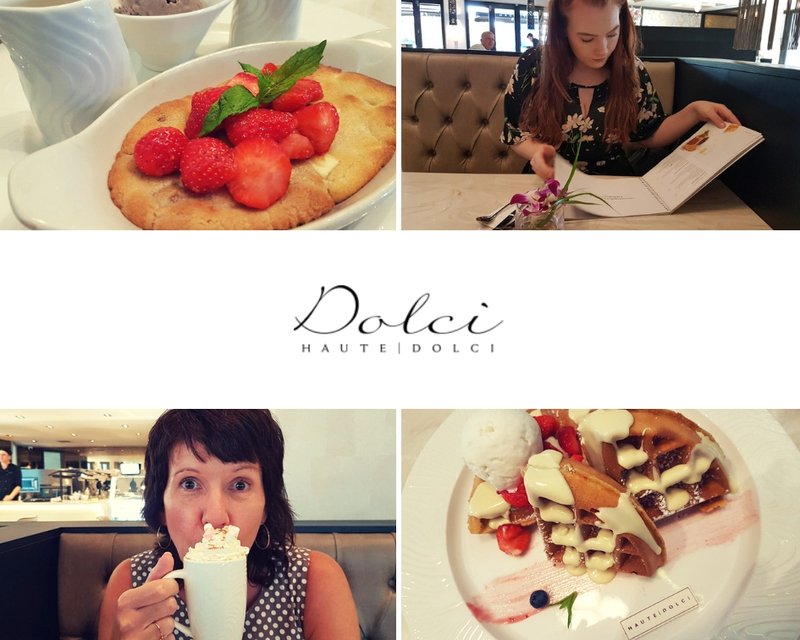 The staff at Haute Dolci were so attentive from the minute we arrived, and we noticed during the hour we spent there that they just couldn't do enough for everyone there which was so lovely to see. 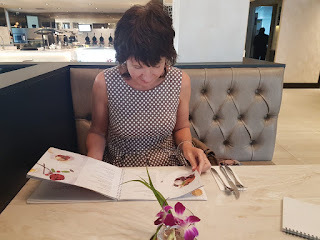 The restaurant has a red carpet that you walk down to be seated, which was a lot of fun, and the decor is just absolutely stunning - posh without being intimidating, and really clean and nice. I'm not a lover of hot drinks so I opted for a coke but my mum went all out with a hot chocolate topped with cream and marshmallows - it also came with a flake but she was in the loo when the drinks arrived so I ate the flake. Sorry mama. She rated it highly anyway, and it did look amazing. Now for the most important part: the desserts. 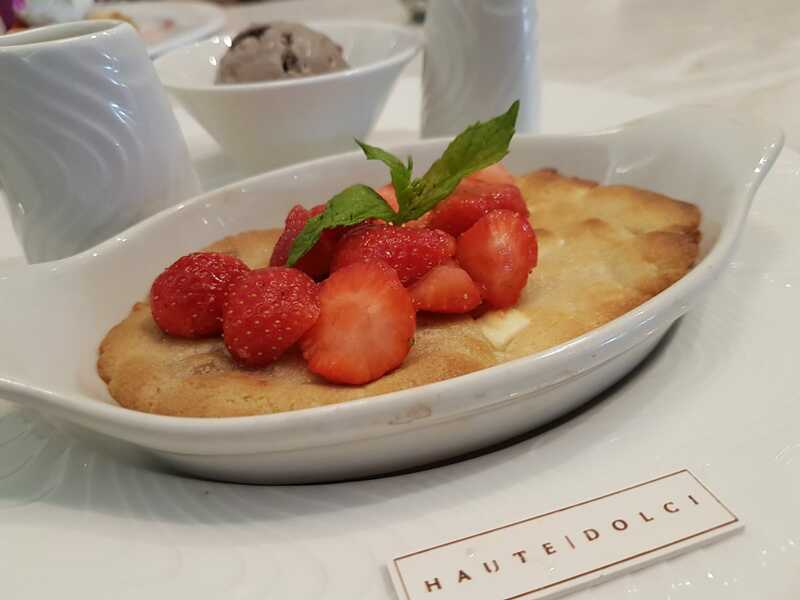 Codie had already been to Haute Dolci and recommended the cookie dough, so I decided to take her advice and go for Best of Both, the half and half cookie dough topped with strawberries, which comes with little pots of melted white chocolate, melted milk chocolate and a couple of scoops of your choice of ice cream. I went for the cookies and cream ice cream just to stick with the cookie theme, and the whole thing was amazing. The cookie dough was perfectly soft and molten - one half was milk chocolate chunk cookie dough and the other half was filled with white chocolate chunks. I managed to eat nearly all of it, too, because it wasn't too sickly like some desserts can be. This will set you back £7.30, which is pretty good for a luxury dessert in my opinion. 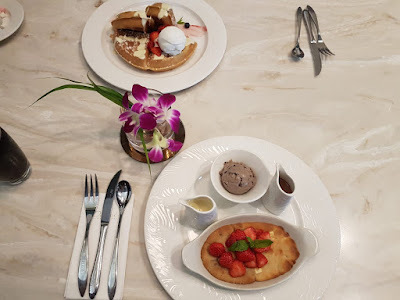 My mum opted for I'll Have What He's Having, a giant American-style waffle drizzled with white chocolate and topped with strawberries and a scoop of coconut ice cream. It looked amazing and she informs me it was delicious, although it was massive and, post-hot chocolate, she couldn't quite finish it all so maybe don't get a huge hot chocolate *and* a pudding if you don't have that big of an appetite. This dessert will cost you £5.30 which again is such a decent price for what you get, especially in such a luxury setting. So would I recommend a trip to Haute Dolci? Definitely. The prices weren't as expensive as I'd imagined they would be and the desserts were genuinely delicious - plus the location is great, slap bang in the Coliseum where you've got restaurants, shops, the cinema, bowling/trampolining/mini golf and even a Travelodge, not to mention the outlet shopping park next door if you fancy grabbing some bargains. Where's your favourite spot for luxury dessert?